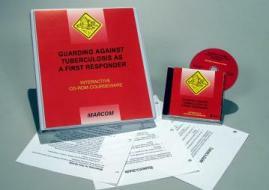 MARCOM's "Guarding Against Tuberculosis As A First Responder" Interactive CD-ROM Course has been specifically created to assist facilities and operations whose employees have a risk of exposure to tuberculosis... and that therefore must conduct employee training as specified in the CDC Guidelines. Because the spread of tuberculosis has increased dramatically in the U.S. in the last several years, OSHA in 1996 issued a set of new Tuberculosis Safety Directives... which enforce the 1994 Center for Disease Control (CDC) Tuberculosis Prevention Guidelines, and allow for the wearing of new NIOSH-approved respirators/masks, as well as HEPA masks. Areas covered in the course include the history of tuberculosis as a disease, epidemiology and symptoms of tuberculosis, modes by which tuberculosis is transmitted, the CDC guidelines, the exposure control plan, recognition of exposure situations, practices to prevent exposure, administrative and engineering controls, selection and use of personal protective equipment (including respirators), and more. Using a powerful combination of audio, full-motion video, text and colorful graphics, this course provides the most cost-effective safety and regulatory compliance training available today. The course is divided into a number of logical sections so information is easily understood... and retained. Also designed with the training manager in mind, all courses in the Interactive CD-ROM Training Library include a learning management system (at no additional cost). Using this system, trainers can set up "Pre" and "Post" tests... establish log-in procedures... even define and set up curriculum for various job classes. The system also collects and organizes employee performance information through a powerful relational database, which can generate a number of record-keeping and tracking reports... and has a database "import/export" feature, which allows information to be transferred to and from an external database (such as a company's personnel database). The course is one of over 100 titles currently available in the Interactive CD-ROM Training Library.